When Koko the gorilla realised she had toothache, she simply called for the dentist. The ape, famed for her language and communication skills, managed to let her handlers at the Gorilla Foundation in California know that she was in pain. After apparently feeling discomfort for a few weeks, she reached the point were she indicated at the number nine on a pain chart mapping the intensity of pain on a scale of one to 10. Twelve specialists, including three dentists, two vets and a gynaecologist volunteered to give the 33-year-old gorilla a thorough medical check-up while she was under anaesthetic on Sunday. The dentists finally extracted a tooth and performed some work on Koko's gums, the foundation's development director, Lorraine Slater, told BBC News Online. Other than that, Koko, who has an IQ of between 75 and 95, was found to be in good health. 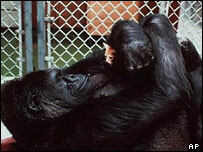 Koko uses a sign language of 1,000 gestures to communicate with humans and can understand 2,000 words of spoken English. "She's quite articulate," a volunteer at the foundation, whose mission is to pioneer communication between species, told the Associated Press news agency. "She'll tell us how bad she is feeling, how bad pain is. It looked like it was time to do something," JohnPaul Slater said. The team of medical specialists gave the gorilla a general anaesthetic and set to work with portable X-ray machines and ultrasounds. "It's not often we get to work with a celebrity," David Ling, assistant professor of medicine at Stanford University, said. "Probably Koko is less demanding."